The Genealogical Proof Standard (GPS) was developed by the Board for Certification of Genealogists nearly 20 years ago. 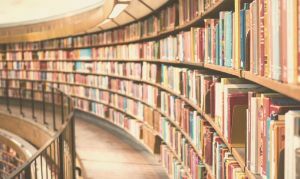 It describes what makes up sound genealogical research and can (should) be used by all researchers, not just those who are credentialed or do research for hire. It's made of 5 components, which work together. Reasonably exhaustive research doesn’t mean you have to find every possible record. It doesn't mean that you're required to find the piece of paper that slide behind the filing cabinet at the courthouse 40 years ago. It means you look for the records that a competent, thorough researcher would be expected to find. If you’re trying to identify your great-great-grandmother’s parents, have you looked for her birth certificate? Let’s say that there aren’t any birth certificates when she was born, so you look for her death certificate and it names the parents. But is that reasonably exhaustive research into identifying her parents? Probably not. To be exhaustive, you would also need to take a look at her marriage records to see if she names her parents on there. You would also look at the census to see who she is living with. You would look at the probate and land records of the people named on her death certificate to corroborate (or refute) what it says. What if you want to identify when and where your great-grandfather died? Finding his memorial on FindAGrave is not reasonably exhaustive, as there are numerous other records that you should look for, such as his death record, obituary, probate, etc. You can use the FindAGrave information as a clue for more research, but that memorial by itself isn't reasonably exhaustive. Source citations are not the most exciting aspect of genealogy. But it is darn near impossible to do research without them. 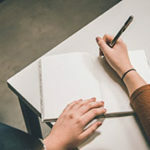 Source citations allow us to see where our information came from, which helps us find it again if we need to, as well as giving us a way to evaluate what we have. Note that this part of the Genealogical Proof Standard calls for “complete and accurate source citations.” It doesn’t say anything about formatting. It’s about having all of the necessary elements that you need in a citation. What goes into a good citation? 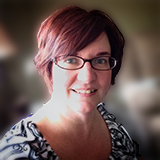 Sign up for Amy's free newsletter and get the free guide "Elements of a Good Source Citation"
Regarding accuracy, that doesn’t apply only to having the correct page number in the citation. It means that you’re citing what you actually used. So if you used book of will abstracts, you cite that rather than citing the will (which you didn’t actually see.) If you used a database of marriage records, you cite the database, not the marriage records in the probate court. If you find a record and you just skim through it to pick out the one fact that you were looking for, that wouldn’t be a thorough analysis. This part of the GPS is all about understanding the records that you’re using. Are you reading it correctly? Are you understanding the terms that are used? Do you know where it came from and why it was created? How does it fit in with other records and with other information that you have? ​Sooner or later, your research will uncover records that conflict. One record will name your ancestor’s father as John and another record will say it’s William. Which one is right? Is either one right? This part of the standard is about how you evaluate all of the evidence that you have so that the conflict is resolved. Can you explain why one record is incorrect? Can you make a convincing argument why the other one is right? Just making an excuse for the record isn’t a resolution of the conflict. ​Yes, it says ‘written conclusion.” if you have a situation where you have conflicting evidence, a single source citation isn’t going to cut it. You need to explain how you came to the conclusion that you did. Writing is also an aid to our research. Having to write something down forces you to think it through, which can help you spot errors in your logic and holes in your research. 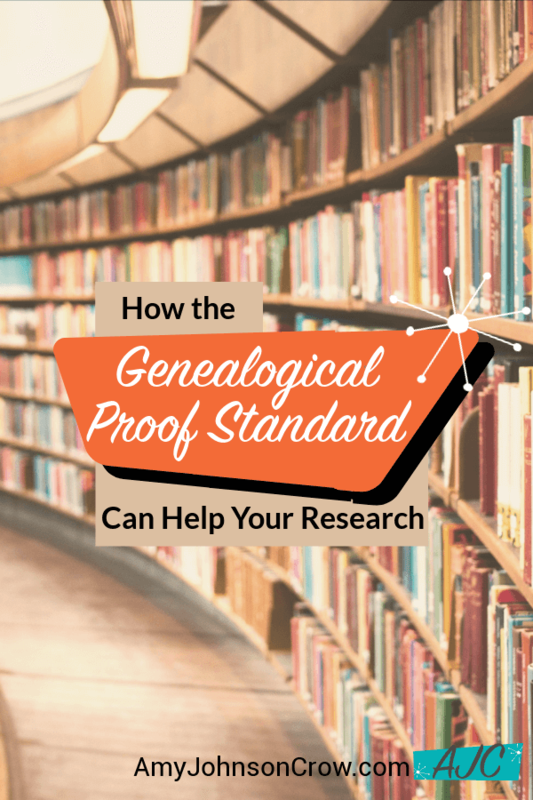 The Genealogical Proof Standard isn’t just for professional genealogists. It’s for anyone who wants to do good, solid research. When you keep the 5 components of the GPS in mind, your research will be a lot stronger. Is Perfectionism Ruining Your Genealogy? 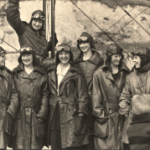 This entry was posted in Podcast and tagged Genealogical Proof Standard, research, standards by Amy Johnson Crow. Bookmark the permalink. Great advice all around, Amy! Although I sure wouldn’t mind finding that piece of paper behind the filing cabinet. I feel like that’s probably the key to my brick walls. I wouldn’t mind finding it, either! A good reminder for everyone; I am posting to FB! Good advise. I think what you really must be careful of is accepting facts on someone else’s trees as fact. They can be good hints but you don’t know if they’ve been verified – use the hint as a starting point but then do the research! I agree, I see this all of the time and it makes me afraid to accept what someone else has without sources for proof. Where exact “paper trail”, evidence is lacking would dna matches in an overwhelming matter be considered as an evidence point to connect to a particular family group? Another great blog post. A simple and easily understood summary of the Genealogical Proof Standard. Will go into my genealogy toolkit as a quick reference tool. I will add to Facebook too. Thank you Amy. Solid advice about how this works. Thanks for the succinct tips on proof. Its so important to do the searching and proofing before putting it online publicly for others. So many on Ancestry just copy & paste without digging into the depths themselves. Thus, the record goes unchecked and many times inaccurate information passes from one to the other. I do wonder if there is a way that we can pull the valid information & only make that part public as we move thru the other questionable ones until those have been validated as well. That’s a great question, Juanita. One way to have your “verified” data public is to have two trees. The public tree is for the things that you feel confident about. The other (private) tree is your working tree, where only you see it and you can have it as messy as you’d like. It does require you to copy things from the “working” tree to the “public” tree when you’re confident, but it is do-able. Though it is only a starting place, I like that most of the genealogy sites hint you in the direction of where to look. I like that Rootsfinder, the online tree, is able to hint from multiple websites simultaneously. 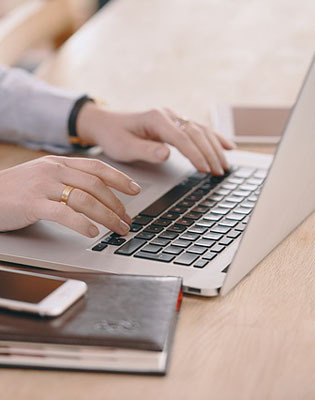 If you are at a family history center with access, you can look at websites you might not have thought about beyond the big 4. But that can create so many rabbit holes, it is difficult to focus on one area intensively if you keep looking. That’s where learning and using the GSP can come in handy to keep you focused. "Elements of a Good Source Citation"